St. John's Wort can have a beneficial effect on metabolism and bile secretion. It also improves circulation, has a general anti-inflammatory effect, stimulates appetite, relieves depression and promotes sleep. For mild to moderate depression, many people find that St John's wort gives them just the boost they need. St John's wort can also be helpful if you suffer from the effects of general stress, Seasonal Affective Disorder or anxiety. 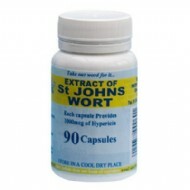 Each capsule contains high quality St. John's Wort extract equivalent to 1000mcg of Hypericum. High quality St. John's Wort extract equivalent to 1000mcg of Hypercin.